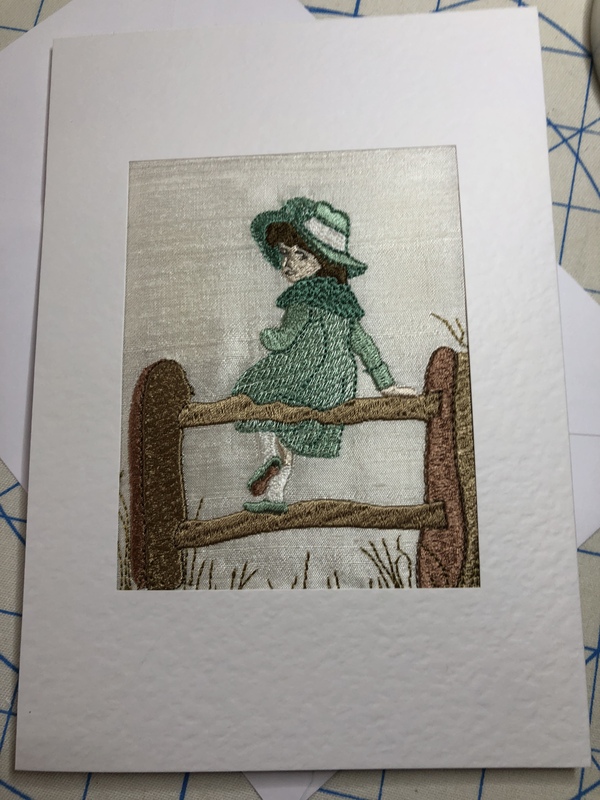 The challenge I set myself this year for my sister’s birthday card was to create a textured coat with an astrakhan type collar on one of Kate Greenaway’s little children. 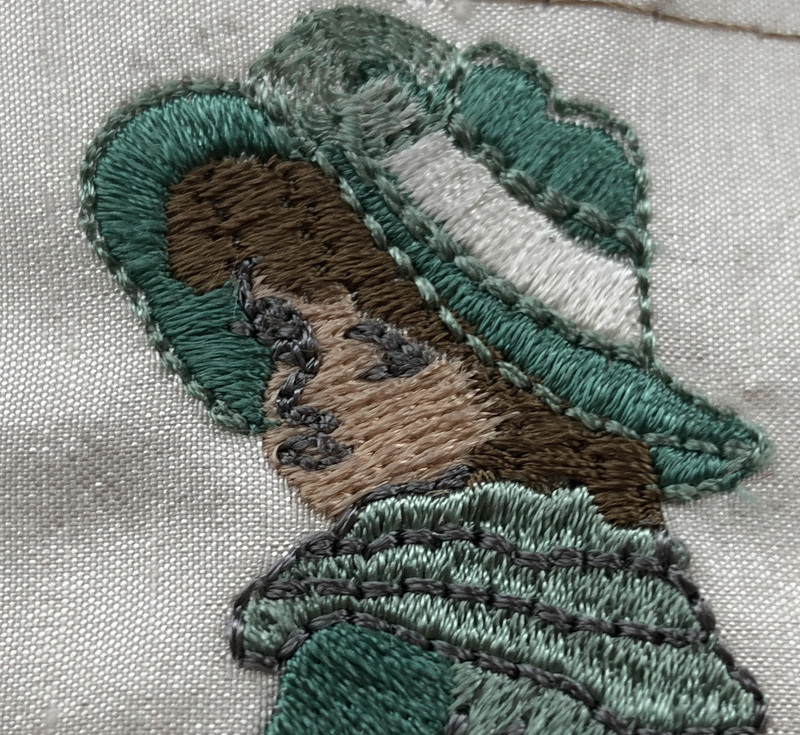 New features in my embroidery software have allowed me to do this and it has been fun to see what I could create, using several coloured threads to blended together to form the fabric. 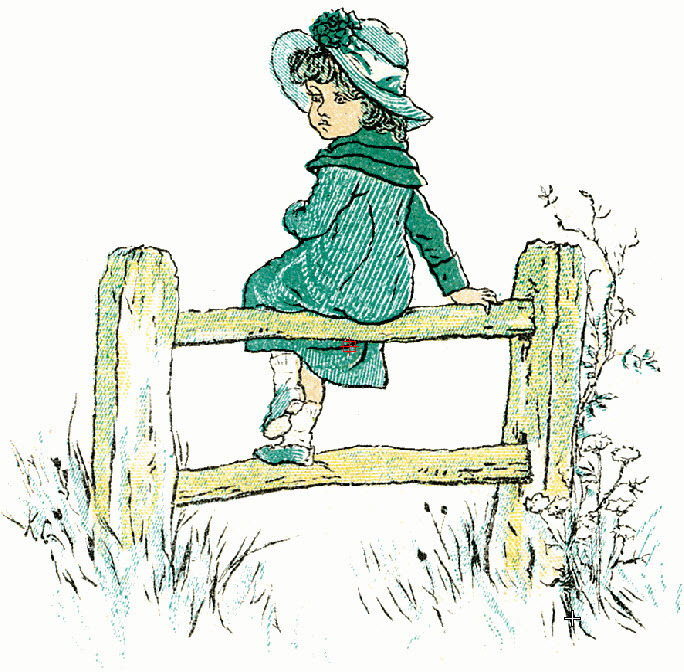 There is a beautiful simplicity to the art work of Kate Greenaway and I have long admired it, intending to digitise some embroidery designs from it. Born in 1846 Catherine Greenaway was a children’s illustrator. She was educated at the Royal Female School of Art. I think it is the style of dressing the children in her water colours that I find fascinating. I adore the mop caps, bonnets, pinafores and ribbons which reflect the Regency period, which you know I am particularly interested and drawn to. Apparently, Liberty’s of London created some children’s clothes inspired by these well-dressed little people. There is movement, fun and a little naughtiness in her children. 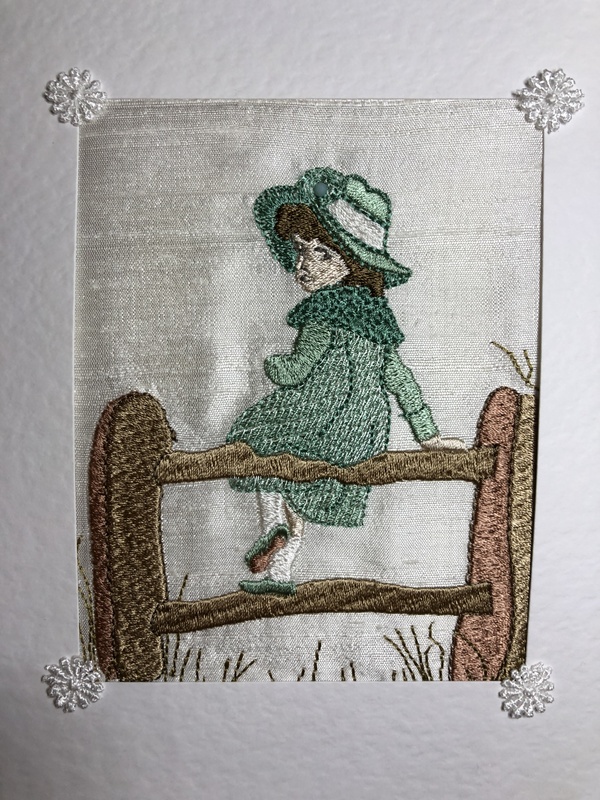 I decided to create individual designs from these remarkable images, and my first design captures a little girl sitting on a fence. I particularly love her hat, sad that fashion no longer demands that we wear such creations every day. 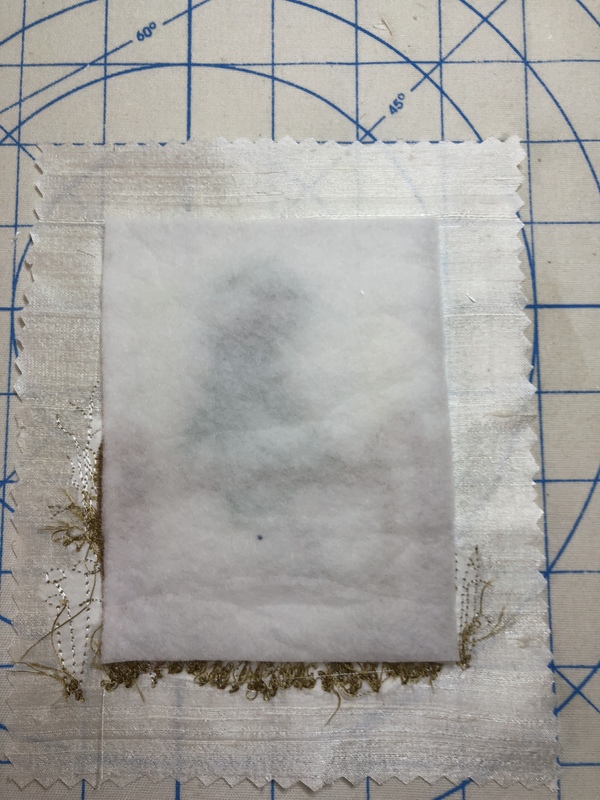 After experimenting I found that her facial features were sharper if stitched in a 60 wt thread so I recommend Mettler cotton 651 cobblestone. You can see the difference in this earlier stitch out, although the light is not as good. In researching this image I have seen it with a rose coloured flower on the hat which gives a different look and lighter coloured hair could also be considered. To capture as much detail as possible I have not gone for a 4″ x 4″ design, and I managed to find a card with a square aperture, so I could make a birthday card for my sister. I have kept the colours of the original art work as much as possible and used my normal system of inserting the finished embroidery into the card. My pressing board with its lines enables me to line everything up perfectly, as they show through my silk dupion fabric. The finished card just did not have the “wow” factor, so I added a little lace daisy at each corner and a turquoise pearl on the flower of the hat. This was just enough as I am sure these little people had no embellishment on their clothes! This design will be released tomorrow, Thursday April 5th, 2018. 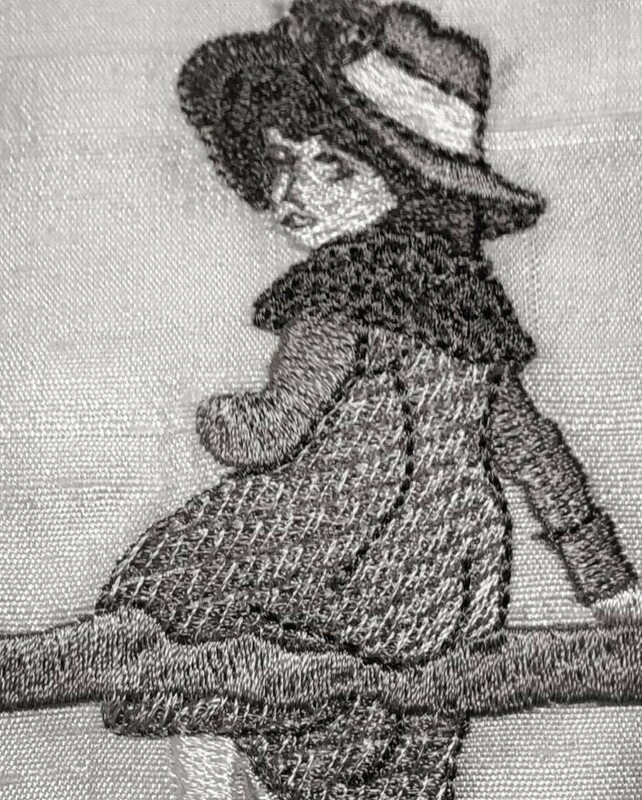 This entry was posted in Discussing machine embroidery, Embroidery projects, New Designs and tagged development of embroidery, embroidery on silk, machine embroidery, Making embroidered cards, The importance of colour. Bookmark the permalink. Are you going to release the design Hazel -it’s really lovely? I often make cards in the same and find that friends keep them for years. That is absolutely gorgeous! The texture you’ve created is amazing. It was great fun to develop. Now I understand how to create it I will be able to do more blending and textures. Wow, that’s lovely, I know just the person who would love it. Beautiful. Such detail. We are blessed with your talent. It’s worked out well, Hazel, well done. I love those old children’s books. I adore this design. You have captured the perfect colors again. 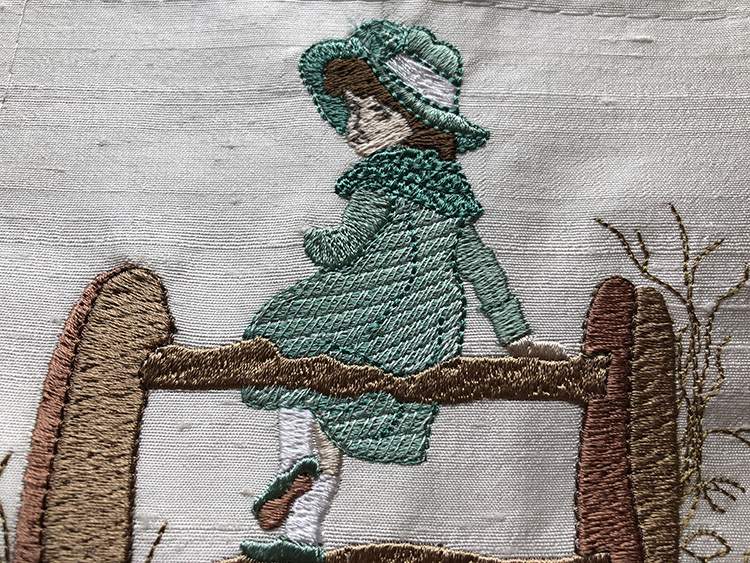 Hazel, You have definitely captured the essence of Kate Greenaway’s little girl in your very realistic embroidery rendition. 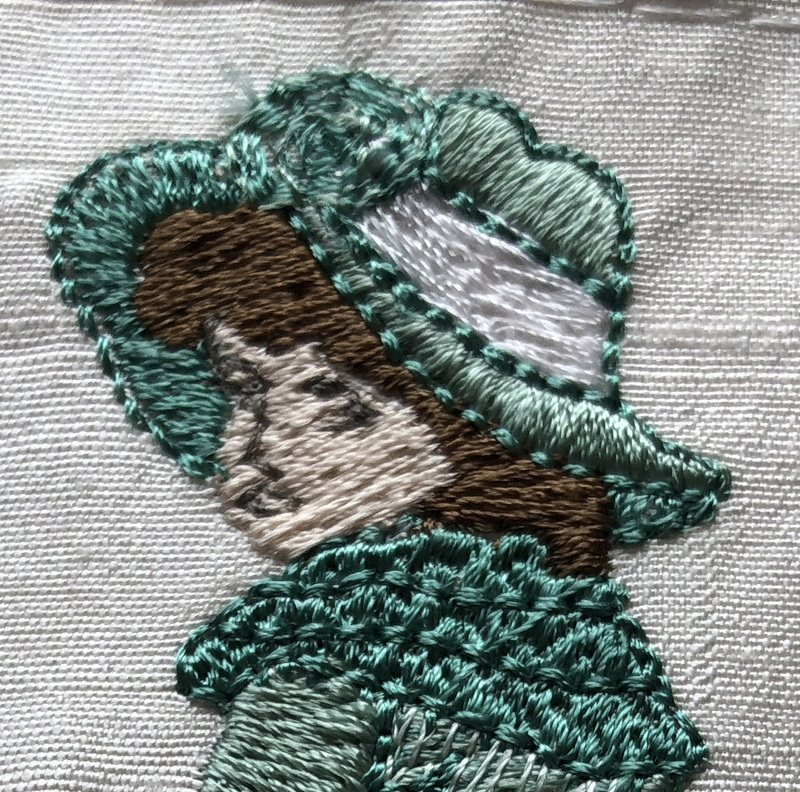 She is just precious, and I hope you decide to do more of the Kate Greenway characters in this unique embroidery style. So pleased you like her. Like very much, adorable your work of Kate. Thanks.